Oxfam is an international charity organization that was formed in 1942 as a famine relieving organization but has now transformed into and organization that seeks to reduce world poverty and find lasting solutions to world poverty. It possesses two forms of revenue generation, Oxfam stores and fundraising, with majorly of its revenue coming from the latter. In this marketing plan, Oxfam intends to both awareness of its agenda in poverty and injustice reduction by motivating its workers and rebranding its Oxfam stores. To do this, a total of ₤678400 was allocated to two projects as shown in the appendix table 3. This were to monitor and implement the agenda according to three task. The progress and improvement was to be during the implementation of each project. Oxfam was originally formed in Oxford in 1942 by a team that included social activists and Oxford academics with the sole aim of relieving famine in Greece. These charity organization then went through profound changes that have seen it turn into an alliance of seventeen organizations that operate in approximately ninety countries all over the world (Oxfam, 2016). These countries include Great Britain (Oxfam GB), Ireland, America, New Zealand, India, France, Germany and Hong Kong. It is important to note that each affiliate is given a unique name of which it is associate with. Collaboration between and amongst these affiliates is overseen and supported by OI (Oxfam International) secretariat. This collaboration is essential especially since it generates its income through fundraising and Oxfam shops that sell donated items. This culture began from as far back as the 1940s (OxfamB, 2016). Its major aims are to be at the forefront of initiating and finding solutions to world poverty and social injustices around the world. Notable concern is placed on injustices related to gender and the acquiring of positive discrimination for past injustices. It directly engages with the communities that are affected by poverty, mostly in Africa, and powerful leaders to ensure its objectives are met (Oxfam, 2016). In order to address social justice, Oxfam adopted the human rights approach as envisioned by organizations such as United Nations. This rights include: the right to life and security, the right to freedom of speech, the right to access social services and right for basic human essentials(food, clothing and shelter) (OxyfamPDF, 2012). Its mission is to address the intricate structural causes of poverty and injustice around the world (Oxfam, 2016). Oxfam is so committed to the issue of addressing world poverty and injustice that it has lost employees and volunteers in insecure countries such as Afghanistan (Millaway, 2012). Oxfam has engaged with political leaders from all over Africa to initiate laws that facilitate the reduction of poverty such as the reduction of taxes (OxyfamAmerica, 2016). Most notably, most of these leaders have been known to duck responsibilities associated with issues such as global warming, gender equality and security. Security is a major issue in countries such as DRC. Global warming has been evaded by G7 members for political reasons (OxyfamAmerica, 2016). Its intention to seek political control was evident when the charity was associated with Blair’s campaign and government ( Quarmby , 2005). Like most charities, Oxfam relies heavily on the availability of disposable income to further its aims in fundraising and sale of items through its shops. The rise of disposable income in developed countries such as UK and USA have seen its revenue collection grow profoundly since its inception. Thus, majorly if its revenue comes from both institutional and individual donors in developed counties. There is also a new segment of donor coming from previously developing nations such as China giving meaning to the course of its mission and vision. Despite Oxfam generating it revenue from two sources (Oxfam shops and fundraising), it relies mostly on the latter that helps it generate more than 70% of its revenue averaged from all its affiliates worldwide. Fundraising for its revenue has come for donors who participated in the London Marathon and volunteer stewards such as that in Glastonbury. Oxfam operates with affiliates and supporters all over the world and therefore this makes its brand gain more credibility to donors, both institutional and individual. Due to this brand name, Oxfam has been able to receive constant reviews from donors who support its course. Its perspectives on the course to change the world poverty levels and reduce the gap between the rich and poor is constantly shared on blogs and its website. Oxfam is well noted for its fail price electronic gadgets sold over its shops. Some of this are donated from both individuals and institutions. This items are sold online and have competitors such as Amazon. To further its goal, Oxfam is known to constantly release reports the situation of rights and reduction of poverty through its website and blogs. Some this blogs are vital in building knowledge about the progress the charity has made in various countries on issues such disease reduction (HIV/AIDS in South Africa) and Global warming in Australia. The viewpoints of all are encouraged and Oxfam gauges its progress from these reviews and prove of impact. Oxfam is highly recognized for its role in initiating and implementing global warming laws in US and developed countries. Oxfam America was at the forefront in regulations that reduced carbon emission through regulations such as those that require automobiles to have converters. Starbucks is criticized for its role in Ethiopian coffee and Starbucks licensing agreement. This agreement was termed as poised to have adverse economic effects to Ethiopia and its coffee farmers and Starbucks had a better idea of handling the situation (Economist, 2006). The charity is also criticized for its role in seeking commercial favours for Dole bananas in Philippines. It is also criticized for not being politically neutral especially when it got close to the New Labour market government and Tony Blair in the UK. Oxfam as a charity has strengths in its possession of clear goals that it targets in different countries. The clarity of these goals has motivated donors worldwide. It also has the strength of being and association with many supports and affiliates creating and boosting its brand. It also diversified in the manner it deals with issues such as poverty in Africa and global warming in developed countries. Since items sold at its shops are fair priced, it is less competitive in attracting and selling luxury products. Its presence in the retail store is also less when compared to its competitors globally. This may be because its brand is less known as retail store but only as a non-profit charity organization. Since Oxfam has already established online communication platforms, it has the potential to initiate fundraising through advertisements. It also has an opportunity at building a brand recognized as a retail shop. Oxfam is threatened especially with the death of volunteers and employees in insecure countries such as Afghanistan which has had a toll in employee commitment. Customer motivation is highly absent in both its online and physical shop (retail) outlets. It is also threatened by a continuous reduction in the quality of products offered at its retail outlets. Improve on its ability to advertise its brand and thus raise awareness through social platforms and activities within one month. This platforms are also to be used in fundraisings. Initiate and implement a new brand that shall be fully recognized with its retail stores to improve revenue generation within a month and its retail store’s competitiveness globally. Initiate programs that shall search, motivate and encourage volunteers and its employees to participate in poverty reduction and championing of human rights all over the world in three months. Create a brand that is solely recognized as its retail shop to improve on recognition and competitiveness. Create social platforms within its website, blogs and in social media (such as Facebook) that shall be used for fundraisings and to raise awareness to its course. Initiate programs that incorporate leaders and communities as both participants to its issue and donors. Design programs for motivating its employees and volunteers alike, especially those in insecure countries such as Afghanistan. Segmentation at Oxfam shall involve comprise two aspects: its fundraising objective and motivation to its employees and volunteers. Employees and volunteers are to be categorized into groups based on the nation they are posted to and the security nature of the nation. Nations that are extreme towards the implementation of rights issues such as gender equality due to religious issues such as Afghanistan Islamic views of rights to woman are to be given motivations in form of gifts and allowances. Workers in countries such as Australia and USA shall be motivated to continuously assess the charities contribution and their role in effecting sensitive issues such as global warming. In order to effectively market its goods sold at its shops and thus raise its supplement revenue source, Oxfam shall segment its clients into three categories: Those who frequently visit is online retail shop and physical shop outlets, the buyer’s inclination to purchase products online or at outlets and donors whose products generate high volumes at its stores. This segmentation will then be oriented towards marketing the new brand to be implemented together with its retail stores both online and at its various outlets all over Britain and USA. Develop programs that shall target employees and volunteers in insecure countries to constantly monitor their progress and morale. Positioning will be done depending on the effect of the reward systems to each of the segments shall be noted and improved upon where necessary. This positioning will also depend in the gravity of the poverty levels or inequality level at that specific country. Positioning will be done to enable Oxfam market its new brand to both prospective buyers and donors depending on their inclination to buy Oxfam’s items online or at its outlets. Marketing will then be done both online and at its outlets respectively depending on the characteristics of the segmentation. Targeting will be done on the items that receive the highest purchases in order to influence the brand and ensure it is widely recognized. Initiate and implement programs that monitors their employees and how its agenda on poverty and injustice reduction is handled worldwide (people and product). This programs shall monitor the effectiveness of the reward programs employed under different jurisdictions. Create social platforms and advertisement techniques that shall see it improve the effect if its new retail brand (product). Using its fair price orientation to woo clients (price). Initiate programs that shall evaluate the benefits in terms of increase in revenue collection associated with its new retail store brand. To ensure fulfilment of the timed objectives, a budget of ₤678, 400 was assigned to the two projects meant to deliver the objectives. The budget was subdivided within the projects as depicted in table 3. The miscellaneous expenditure values were calculated and estimated to reach a total of €8, 400. Since two projects shall be accountable for implementing the objectives, both shall be accountable for analysing and representing the quantitative and qualitative indicators continuously during the implementation process. The quantitative indicator for new brand value shall be majorly based on the amount of revenue accrued as a result of implementing the brand to Oxfam’s retail outlets both online and offline. Indicators to also evaluate how the brand is competing with renowned outlets such as Amazon will also be evaluated and noted. The process indicators shall be very valuable in evaluating the impact on the reward and monitoring system in improving worker morale. This, together with qualitative indicators, shall match worker morale with the extent of delivering on Oxfam’s objectives in respective countries. For instance, worker morale in Afghanistan could be qualitative quantified as medium due to the fact that the progress of alleviating poverty is taking longer than usual or is achieving very little progress due to inhibiting factors such as low worked morale or religious values. Recognize and elaborate on the advertisement aspects that made Oxfam’s new brand reach out to the public and donors and influence on their ability and willingness to donate to Oxfam. Attribute each program in improving and effecting Oxfam’s agenda at reducing global poverty levels. 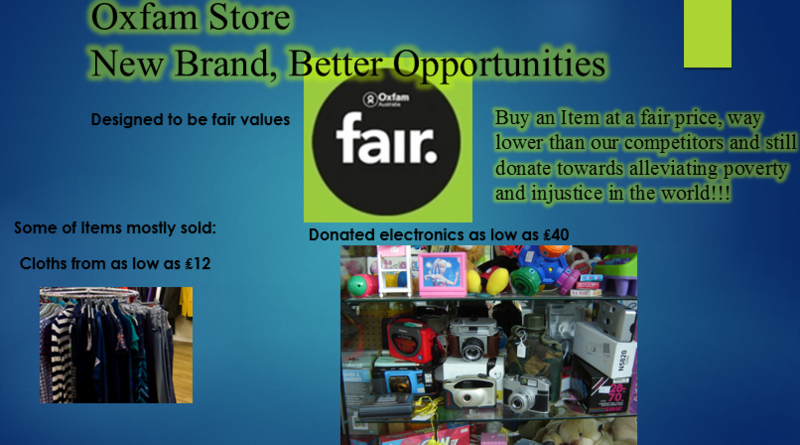 The message to announce its new brand shall incorporate pictures of the items sold at fair price at Oxfam’s stores and how the sale of these items improves on the revenue generation at Oxfam in an advertisement leaflet as depicted in the image below. Advertisements based on this message shall be posted on Oxfam’s website, online retail store and its outlets. In summation, it is quite clear that Oxfam has the intention of improving its revenue source thorough rebranding its retail store both online and at its outlets. It also intends to further its course and awareness of poverty levels and injustices in the world by properly motivating and monitoring its employees. Through its two timed objective, it shall achieve a better competition in its retail stores thus resulting in higher revenues and a properly motivated workforce that shall monitor and meet its agendas worldwide. This shall vary depending on the country, level of execution and process involved towards achieving the objective. Two projects were initiated and funded in order to implement this strategy as shown in table 3 in the appendix. Quarmby , K. (2005). Why Oxfam Is Failing Africa. New Statesman. Economist. (2006). Oxfam versus Starbucks: And this time, Oxfam may be wrong. Political Lobbying for laws that reduce poverty levels such as lowering taxation. Political frustration associated with contentious issues such as global warming. Economic Relies on donor availability of disposable income and thus susceptible to economic change. Social Is organized into affiliates prompting social participation. It constantly engages the public in social platforms. Technological Well versed for its sale of fair price electronic gadgets. Constant online presence in release of reports on its progress in countries all over the world. Legal At forefront in initiating and implementing legislature that regulates carbon emission. Ethical The Ethiopian coffee and Starbucks contract suggestion that would have led to economic turmoil for Ethiopian farmers. Lack of political neutrality especially in the UK situation with Blair ( Quarmby , 2005). Strengths Composed of affiliates thus a strong brand. Fair price associated with its stores. Clear goals and objective furthering objectives. Weaknesses Luxury products not commonly preferred in its stores. Less global brand recognition globally. Table 3: Budge for the Two Projects. Project Revenue Improvement and progress monitoring Worker Monitoring and progress monitoring Worker Reward Program and progress monitoring.